The TMP3200EAS is a special electromechanical pin configuration of the versatile TMP3200 PINSTAMP® marking head, specifically developed for 2-D code applications. It is easily integrated into either on or off-line applications and includes an electromagnetic marking pin and an AUTOSENSE motorized Z-Axis mounting post that ensures a consistent pin stroke for highly repeatable 2-D cell sizes. No operator intervention is required -- pattern specific standoff setting ensures that the critical standoff distance is consistently repeated -- A great tool for multiple plane marking. 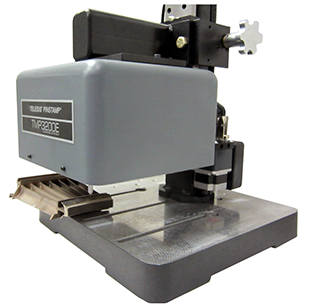 The TMP3200/470EAS Single Pin Marking System features a large 4" x 6" (100mm x 150mm) marking window, and marking speeds up to 2.5 characters-per-second. Well suited for both bench top and factory-automated applications, its robust dual stepper motor X/Y platform yields high quality characters and low maintenance operation. 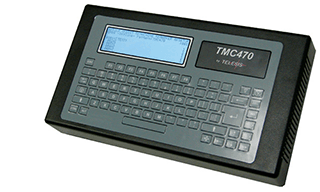 Self-Contained, state-of-the-art TMC470 controller features two serial ports, USB port and Ethernet port.